Let’s cut right to the chase: Perfect Privacy is one of the most expensive VPN providers on the market – but it’s also known as the best VPN for online anonymity. So here is the key question most people are wondering: is Perfect Privacy worth the high price? 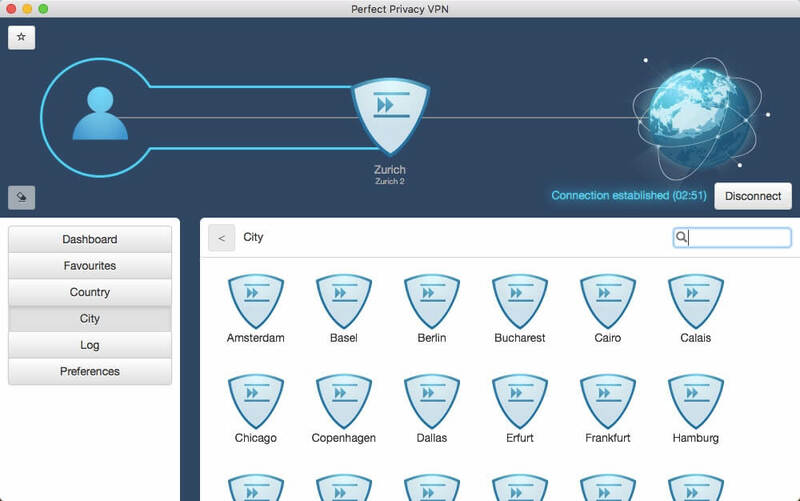 Perfect Privacy has built a name for itself as an authority in the VPN market. They were the very first VPN to offer self-configurable multi-hop VPN chains with the OpenVPN protocol. Last year they released a feature called Neurorouting, which dynamically routes traffic across multiple hops in the VPN network, corresponding to the location of the site you are visiting (see my explanation here). Perfect Privacy’s TrackStop filter is the most powerful VPN ad blocker I’ve tested, capable of filtering thousands of advertisement, malware, social media, and even Google domains at the VPN server level. The Perfect Privacy team is on the cutting edge of privacy technology. They have been continuously developing their no logs VPN service since 2008 and are one of the most established providers in the industry. They have also earned high praise from the tech community for alerting people to flaws and failures with other major VPN providers. Ultimately it all comes down to what you are looking for with your VPN. If you want a trustworthy VPN service with advanced privacy features, then it is probably worth the money. If you want something simple and user-friendly for streaming Netflix, then you may want to consider alternatives – see the best VPN service report. When you examine the pricing options, it is clear that Perfect Privacy is on the higher end of the scale. Unlimited – Your subscription gives you an unlimited number of connections – whereas most VPN services limit the connections (devices) to between three and six. This allows you to protect every single device in your house with only one subscription. 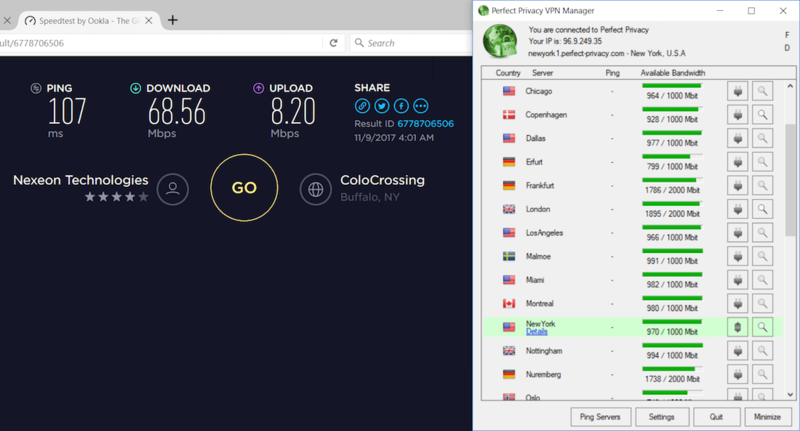 Multi-hop + NeuroRouting – With the VPN Manager client (Windows, Linux, and Mac OS) you can create a multi-hop cascade of VPN servers (up to 4), to give you more online anonymity and security. Additionally, Perfect Privacy has released their NeuroRouting feature. This feature is activated server-side and dynamically routes all traffic across numerous hops in the VPN network (discussed further below and also explained in this article). NeuroRouting is very similar to the Tor network and is not offered by any other VPN service. Payment options – Aside from PayPal and major credit cards, you can also pay with Bitcoin and more than 60 different payment options through Paymentwall. You can even send cash in the mail to their accounting department in Latvia if you want a completely anonymous payment option. Refund Policy – Perfect Privacy offers a full 7 day money-back guarantee, without any tricks or bandwidth clauses. This allows you to test everything out risk free. You can find all the details of the refund here in the Terms. Unlike all the shady new VPNs flooding onto the market promising to make you “anonymous”, Perfect Privacy has been offering premium privacy solutions since 2008. Despite being a smaller company, Perfect Privacy is a major player in online privacy and security. It leads the way in developing advanced security features, with the latest example being their NeuroRouting feature. According to the website, the parent company is Vectura Datamanagement Limited Company, based in Zug, Switzerland. As we have discussed before, Switzerland is an excellent privacy-friendly jurisdiction. Privacy is guaranteed under the Swiss Federal Data Protection Act (DPA) and the Swiss Federal Data Protection Ordinance (DPO). This legal framework offers further protection for Perfect Privacy customers and their data. According to the website, the “Technical Implementation” part of the company is based in Panama under the name “Webinvest International SA.” This is also good because Panama is a solid choice for privacy and is not a close partner with any surveillance alliances. This legal/corporate setup, plus a strong zero logs policy, is a solid combination for protecting customer privacy and data. The unlimited number of connections, plus support for all different devices and platforms, allows you to use your VPN subscription with everything (no restrictions or limitations). Perfect Privacy supports all devices and platforms. You can find detailed step-by-step installation guides in the Perfect Privacy members area. With every platform, you will be given different setup options, allowing you the freedom to use the VPN in the best way to suit your needs. *Note – You will not find the Perfect Privacy Android app in the Google Play Store. This is because Perfect Privacy will not agree to Google’s application requirements, which would infringe on user privacy and give Google information about exactly who is using their apps. Consequently, you will need to download the Android APK file directly from the member’s area here. You can also install the VPN software on your router to protect all of your devices and secure your entire network. See the VPN routers guide for various options. TrackStop – Block ads, tracking and malware domains for your entire home network. NeuroRouting – Gives you a dynamic multi-hop VPN for every device that you use on your router (no extra software needed). Parental filter – The parental filter blocks domains that are harmful for children (pornographic and violent websites). These domains are blocked at the VPN server level, far away from your network. This is a great feature for anyone with children accessing the internet. Router setup guide – The guide I created below walks you through setting up Perfect Privacy on an Asus router. (Note, there are many different Asus routers you can use, from low-cost models to very high end, discussed further in the main VPN router guide). Perfect Privacy basically offers two different kinds of features. I will refer to these as server-side features and application features. Server-side features – These are the features that are activated server-side and will be enabled whenever you access the VPN network with any device and using any encryption protocol. The three main server-side features are TrackStop (which currently includes seven different filters) NeuroRouting, and port forwarding. You can access all server-side features from the member dashboard here. We will cover TrackStop and NeuroRouting in detail below. Application features – Perfect Privacy also offers many different features and settings that are controlled from within the application. We will discuss these in the Windows, Mac OS, and Android sections further below. One major advantage of Perfect Privacy is the built-in advertisement, tracking, and malware blocker, which is called TrackStop. Using a VPN with an ad blocker is a smart choice due to the growing dangers of malicious ads and tracking. 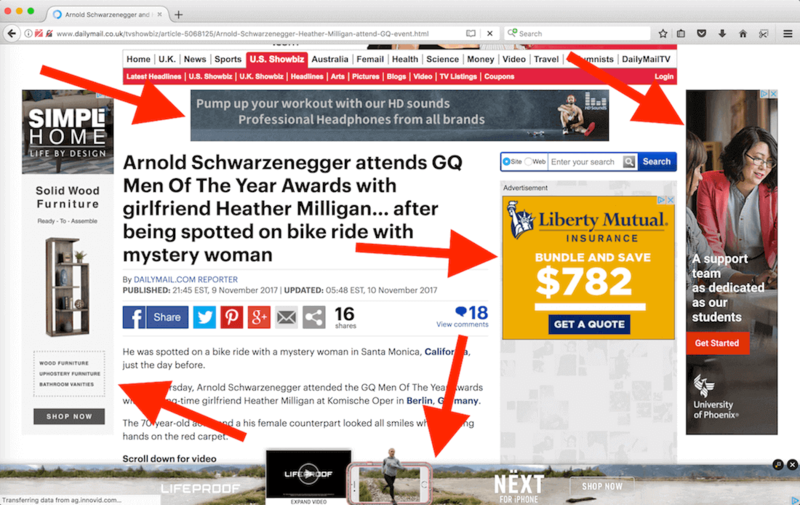 Tracking – Think of every ad as a digital surveillance camera. These ads are quietly recording your browsing history, keystrokes, and page views, and then sending this data off to third parties. Advertisement domains are building up vast amounts of information on your activities to target you with specific ads based on your profile and history. Malware – Online ads, which are usually fed in through third-party domains, are an increasingly common attack vector for delivering malware. For example, malware hidden in the pixels of an image can infect your device in seconds when a website loads (this is even happening to major websites, including the New York Times and BBC). Data – Ads are also a huge drain on your data and CPU – slowing down your device and burning up your data. This is especially true since many ads now include video and/or sound. The best solution is to block ads and tracking on all your devices. To show you TrackStop an action, I took before and after screen shots from the DailyMail website, which blasts readers with lots of ads. Here you can see five different ads just on the top section of this page. There were even more ads at the bottom of the article, some of which were high-bandwidth videos. These ads hijack your bandwidth and slow everything down. All of the advertising domains are blocked at the VPN server level (far away from your computer). This leaves you with just white space, the actual article, and more of your data and CPU (which aren’t being hijacked by ads). Aside from the annoyance and tracking dangers, online ads can also use up a huge amount of bandwidth and processing power from your computer. Blocking ads can significantly improve overall performance and also save you money on mobile data. Fake news filter: this filter blocks a list of websites that is published on GitHub. TrackStop will protect every device that connects to the VPN – without having to install separate ad-blocking software, add-ons or browser extensions. It is simple and powerful. The main drawback with TrackStop is that there’s no whitelist option – but you can easily toggle the different filter settings on/off from the member dashboard. I recently put TrackStop to the test against other major VPN ad blockers. It performed the best by far – see the VPN ad blocker report. One unique feature of Perfect Privacy is the “multi-hop cascade” option. With the Windows, Linux, and Mac OS clients you can create custom VPN cascades utilizing up to four servers. This is one of the most powerful tools available to give you more security and online anonymity. Each consecutive hop re-encrypts your traffic and assigns a new IP address before exiting to the regular internet. While there are other VPNs that offer multi-hop VPN cascades, these are usually limited to only two servers (double-hop). ZorroVPN also offers up to four hops, but only by creating a custom OpenVPN configuration and then importing the config file into your VPN client. Perfect Privacy is the only VPN on the market with the technology that allows you to dynamically create custom VPN cascades directly through the VPN client with up to four different servers. I’ve also found performance can still be quite good when creating a chain of nearby servers (speed tests below). Why use a multi-hop VPN cascade? Even if a VPN service doesn’t keep logs and works hard to protect user privacy, VPN servers can still be monitored (logged) for incoming/outgoing traffic by external authorities, third parties, or perhaps even the datacenter itself. 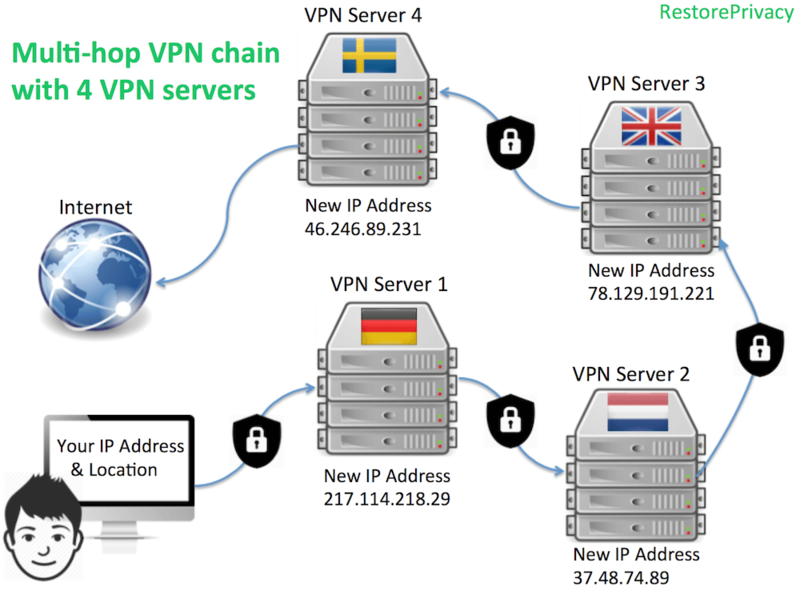 This is explained further in the multi-hop VPN guide. A VPN cascade gives you multiple layers of encrypted protection against these adversaries. To enable the multi-hop feature with Perfect Privacy, simply select the cascading option within Settings and then choose how many “hops” you want to have (up to 4). From there, you can begin selecting the different VPN cascade servers from the main window, one at a time. The order of the cascade will be shown by the numbers on the far left (1-4). You can also modify the encrypted VPN server chain without dropping your connection – simply add or remove servers. These advanced privacy features are slightly more complex to use, but they offer a very high level of security and online anonymity for those who want it. After months of development and testing, Perfect Privacy announced a major breakthrough that takes the multi-hop VPN concept even further – a new feature they call NeuroRouting. Dynamic – Your internet traffic is dynamically routed across multiple hops in the VPN server network to take the most secure route. The routing path is based on TensorFlow, an open source software for machine learning. Your data remains secured and encrypted in the network as long as possible before exiting onto the regular internet. Being based on TensorFlow, the network continually learns the best and most secure route for a given website/server. Simultaneous – Each website/server you access will take a unique path. Accessing multiple different websites will give you numerous, unique multi-hop configurations and different IP addresses at the same time. Each different IP address you broadcast to a website will correspond with the last hop in the server chain for a given URL. Server-side – This feature is activated server-side, meaning whenever you access the VPN network, regardless of the device or app you’re using, NeuroRouting will be active (unless you disable it from the member dashboard). This also means it will work on any device – from routers to Mac OS and Android. Finally, NeuroRouting works with OpenVPN (any configuration) as well as IPSec/IKEv2 (the built-in configuration for Mac OS, Windows, and iOS). In the image below, the user is connected to the Reykjavik, Iceland VPN server with NeuroRouting enabled. He is accessing four different websites at the same time, located in the US, Panama, Bulgaria, and China. The user will broadcast four different IP addresses to each website at the same time, corresponding to the last server in the chain before the website. To enable NeuroRouting, simply turn it “on” in the member dashboard. NeuroRouting is simply enabled within the member area. After enabling the feature, it will be active after about three minutes throughout the server network. NeuroRouting Test Page – I also created a NeuroRouting test page, which demonstrates and tests the dynamic routing capabilities. The test page is now live and can be found here. The Perfect Privacy Windows client offers more features than other VPN I’ve tested or reviewed with Windows. It appears simple at first glance, but it is a powerful application when you get into the settings and features. To optimize speed and connect to the closest server, you can run a real-time ping test, and then rank order the servers by the fastest ping. Real-time bandwidth for every server is also displayed right in the application. Perfect Privacy on Windows 10. As you can see in the screen shot above, Perfect Privacy offers excellent bandwidth at all times. You can check out the real-time bandwidth that is available on Perfect Privacy servers here. From the Settings tab you can also configure different startup options and features. You can configure the client to start with Windows and connect to a designated server. You can configure the Windows client to automatically start with Windows and connect to a designated server. The Windows client offers three different levels for the firewall and DNS leak protection. Most VPNs offer a level 1 or level 2 kill switch. Perfect Privacy gives you the highest protection with a level 3 kill switch, which will permanently block all non-VPN traffic whether the VPN is active or not. 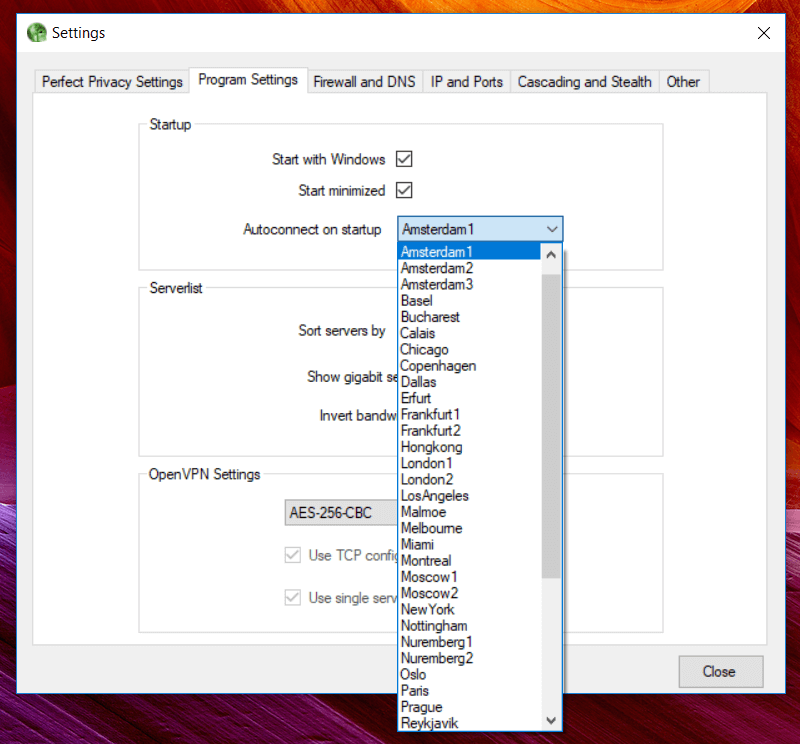 In essence, the software makes a change to the Windows firewall, to only allow traffic through the VPN. I tested the kill switch extensively with the Windows client. Indeed, it did block all regular (non-VPN) traffic, even when the VPN client was closed. The kill switch worked perfectly in testing. Perfect Privacy has added a powerful lineup of obfuscation features, which they refer to as Stealth VPN. Obfuscation conceals your VPN traffic, which is necessary with restricted networks or any location that does not allow (or discourages) VPN use. This is a must-have feature in countries such as China or with various work or school networks that do not allow VPNs. Stealth VPN masks packets to look like normal HTTPS traffic, thereby concealing your use of a VPN while also defeating restrictions and deep packet inspection (DPI). This is a useful feature any time you want to conceal your VPN use or break through restricted networks (China, schools, work networks, etc.). Note: Even though Perfect Privacy is not featured in the China VPN guide, it’s still a solid choice if you are in mainland China where VPNs are blocked. 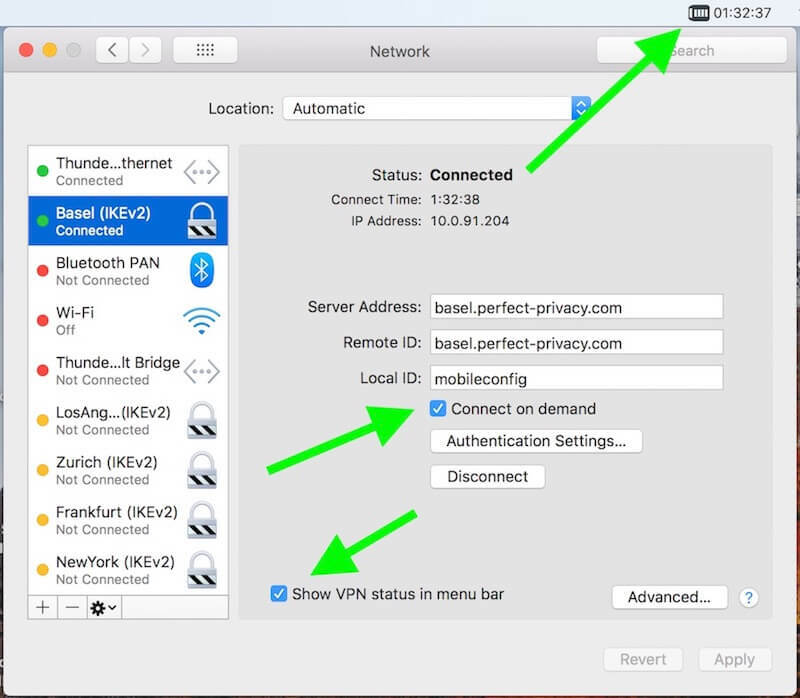 IPSec/IKEv2 – This is the native (built-in) Mac OS VPN configuration that offers a simple, stable, leak-proof setup. 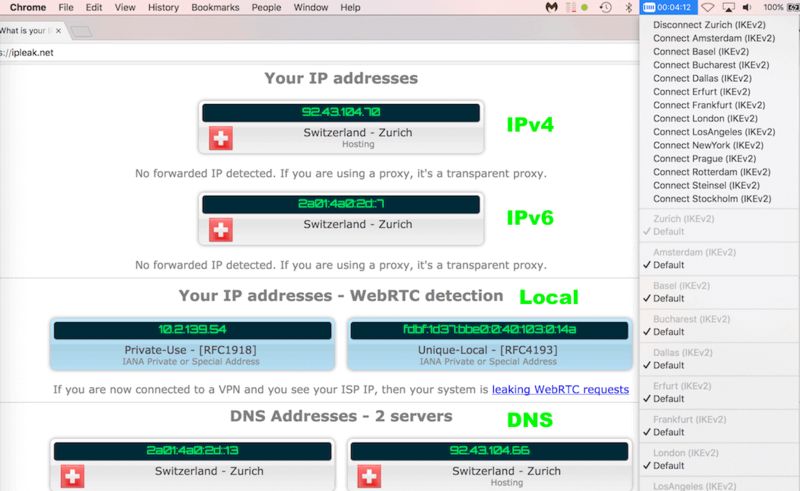 Third-party VPN clients – These include Tunnelblick and Viscosity. The drawbacks with third-party clients is that they do not offer any kill switch. Mac OS client – The new Mac OS VPN client has been released and it performed very well in testing. It offers all client features, including multi-hop functionality, obfuscation, and advanced leak protection settings. IPSec/IKEv2 – The first option using the IPSec/IKEv2 encryption cipher is a good, simple setup. The advantage with this option is that it integrates the VPN directly with the Mac OS firewall. When you enable the “connect on demand” setting from your Mac OS Network Preferences, you get a 100% leak-proof, always-on VPN. All apps will be forced through the VPN, and if the VPN connection drops, nothing will get through the Mac OS firewall (very secure). You can get step-by-step installation instructions here. While IKEv2 is not quite as strong of an encryption cipher as OpenVPN, it is still secure, fast, light weight (less CPU-intenseive than OpenVPN) and can be used natively (no apps required) – see the pros/cons here. While you won’t get all the application features that Windows offers, you can activate both TrackStop and NeuroRouting to use with this IKEv2 configuration. Additionally, the Mac OS firewall kill switch acts as a Level 3 kill switch (on all the time) to keep your data secure. Third-party clients – Two popular third-party clients for Mac OS users are Tunnelblick (free) and Viscosity (one-time $9 license fee). Both of these clients work with the OpenVPN protocol, rather than the IKEv2 option above. The main drawbacks with these third-party OpenVPN clients is that they don’t have a kill switch. This creates a risk for data leakage anytime you interrupt the VPN connection, such as with switching servers or your system going to sleep/waking up. However, you can create a kill switch with firewall rules or a third-party firewall/traffic monitor, such as Little Snitch. Mac OS client – You can also try the Perfect Privacy Mac OS client, which was recently released and supports all features, including multi-hop cascades, obfuscation, and advanced leak protection. This is a great all-around VPN for Mac users that is very secure with awesome performance. I tested out the Perfect Privacy Android client for this review. It performed well, did not have any leaks, and was very easy to setup and use. As mentioned above, it cannot be found in the Google Play Store since Perfect Privacy will not agree to infringe on user privacy. The APK file can be downloaded directly from the member’s area. The Perfect Privacy Android client. Note: While the Android client works well, those who want an always-on VPN configuration (level three kill switch) could instead use the built-in IPSec Android configuration (no app). Instructions for this setup can be found here. When you examine the Perfect Privacy server page, you can see that the network is somewhat smaller compared to other VPNs. The reason for this is fairly simple. Perfect Privacy uses only dedicated (bare-metal) servers, instead of cheap virtual servers that are often logged by the datacenter (server host). Many of the larger VPN services maintain huge networks of virtual servers, which is much cheaper than using dedicated, physical servers. More security – low-quality virtual (rental) servers are often logged by the datacenter (host), even when the VPN is claiming to be a “no logs” service. More speed – you can expect better speeds and better bandwidth on dedicated premium servers. More reliability – Better bandwidth also means better reliability across the network (fewer dropped connections). To provide additional protections for customer privacy, all of Perfect Privacy’s servers run in a continuous RAM disk mode. This is an additional security measure that protects customer data if anything were to ever happen to the servers. If the power goes, all data is gone (nothing is ever stored – no logs). This was very important when their servers were seized in the Netherlands – but no customer data was affected. Extensive testing of different Perfect Privacy around the world found the speeds and reliability to be excellent. I suspect the great performance is mainly due to the server quality and high bandwidth. Of course there are many factors affecting speed (also discussed here). My baseline testing speed from my internet provider was 90 – 100 Mbps (it varied throughout the day). Speed tests with nearby servers were excellent (near full ISP bandwidth). I was most impressed with speeds offered by transatlantic (long-distance) connections. 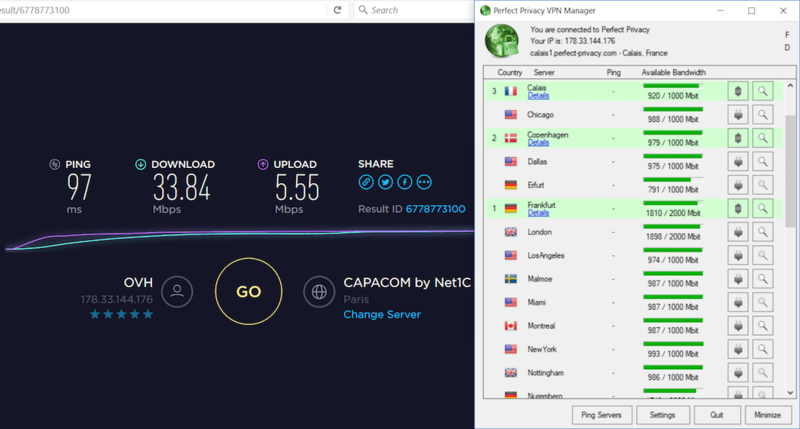 I also tested a few different multi-hop VPN configurations and found the speeds to be quite good considering the different hops an increased latency. It should be noted that there’s generally a performance tradeoff when maximizing various privacy features. For example, using a multi-hop VPN cascade (or NeuroRouting) will drop your speed simply due to increased latency. Overall these are still great speed test results. I even had one reader claim that he hit 600 Mbps download speeds with a 1 gigabyte fiber connection (my ISP connection is limited to around 100 Mbps). When it comes to customer privacy and logs, Perfect Privacy is tough to beat. No logging of any user specific data or activity. No data is kept. We do not monitor, review, log or store your communication/connection data. On none of our servers are any logs which would enable a de-anonymization. Important note: There are many VPNs right now that are falsely claiming to be “no logs” when they are in fact collecting customer data. (See for example PureVPN, ProtonVPN, and Betternet.) Perfect Privacy is currently featured as one of the best no logs VPN providers. Results: Everything passed without any leaks or problems to report. No leaks with the Windows client. For this Perfect Privacy review I tested servers throughout Europe, Asia, North America, and Australia: no problems to report. Perfect Privacy also has a warrant canary on their website – see here. This page keeps people updated on any government actions that may affect user privacy, such as warrants, court orders, gag orders, or other law enforcement action. 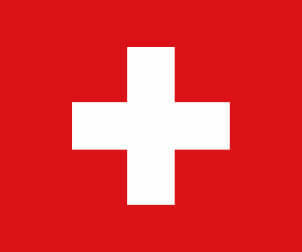 Note that Perfect Privacy is based in Switzerland we are not subject to US-based laws. Furthermore all Perfect Privacy employees are located in countries where there are no laws that would prevent us from disclosing any kind of incident with full transparency. This warrant canary is purely in the interest of transparency and accountability. This is another reason why jurisdiction is important when choosing a VPN service. Perfect Privacy offers different channels for support. One drawback with Perfect Privacy support is that there is no live chat option. However, in my experience I have found the email support to be fast and professional. There is also a user forum, which you can access from their website. The most active part of the forum is in German. Tip: If you have an issue, I would recommend emailing the support department directly rather than posting a question in the forums (for a faster response). Perfect Privacy is geared mostly to those who are seeking a high level of security and online anonymity. Given the massive advancements in surveillance technology around the world, many people are looking for more advanced privacy solutions, above and beyond a basic VPN provider. Perfect Privacy delivers in the areas of advanced security and online anonymity with multi-hop VPN chains, NeuroRouting, TrackStop, and obfuscation features. That being said, it may not be the best choice for everyone. Some people want a basic VPN for streaming Netflix and other services. In this case, VPNArea or ExpressVPN may be better options (see the Netflix VPN guide for more alternatives). If cost is your primary concern, you can find cheaper solutions with VPN.ac ($4.80 per month) and NordVPN ($2.99 per month). Although, these alternatives won’t offer the advanced features that Perfect Privacy gives you. After testing numerous VPN services over the past few years, Perfect Privacy remains the top VPN for privacy and security. Since I first tried their service in 2016, I have been personally using it every day with computers and mobile devices. The server-side features of TrackStop and NeuroRouting provide maximum protection for all devices – whether you’re using an Android mobile with the IPSec/L2TP configuration, Mac OS with IKEv2, or Windows with the VPN Manager app. Their latest addition with the NeuroRouting feature once again illustrates that Perfect Privacy remains on the cutting edge of privacy and security technology, far ahead of other VPNs. With mass surveillance and tracking technologies continuing to advance throughout the world, it’s important to use a VPN that evolves and remains at the forefront of these developments. OK. You’ve purchased your subscription – now what? Conflicting VPN software – If you have other VPN software on your computer, it is usually best to uninstall it before installing Perfect Privacy. Using different VPNs may cause issues with your operating system and firewall, and/or conflicts with different TAP adapters. Conflicting antivirus software – Antivirus software often conflicts with VPNs. First, the best software for Windows is simply the native Windows Defender. Additional software, such as Norton or Kaspersky, usually doesn’t add any benefit and will likely interfere with your VPN. You can usually add a rule or exception to the antivirus software in this case for the VPN. Note: Most antivirus and “cybersecurity” software programs are very invasive, collecting vast amounts of your data for “analysis” and potential sale to third parties – not recommended. TrackStop – You can enable TrackStop from your member dashboard to block tracking and advertisement domains. I would also recommend turning on the “Fraud” filter, which blocks malware and phishing domains. TrackStop will improve page load speed and overall performance, while also saving you money on mobile data (because ads use up lots of bandwidth). NeuroRouting – While NeuroRouting is a great feature for privacy and security, it should not be used if you want to maintain an IP address in a specific location or want to maximize speeds with a certain VPN server. You can activate or disable NeuroRouting directly in the member dashboard. I’d recommend using NeuroRouting by default, as it provides a very high level of security and anonymity. Note, you can also use NeuroRouting in conjunction with multi-hop VPN chains (via the Windows, Linux, or Mac OS clients), although that may be overkill. Windows users – Windows users should use the Perfect Privacy VPN Manager app. It may be a good idea to quickly review the features here before using it for the first time. This is a very advanced and powerful VPN client. Mac OS users – The Mac OS client is a great option now that the full version is released. However, another option for Mac OS users is the built-in IKEV2 configuration because it integrates perfectly with the native Mac OS firewall (no leaks) – see setup instructions here. The IKEv2 setup gives you a level three kill switch (no VPN connection = no internet) and is fast and stable. But if you want all the multi-hop and obfuscation features, you should go with the Perfect Privacy Mac OS client. Linux users – The full VPN Manager app works with Ubuntu and Linux Mint. You can also use Perfect Privacy with Terminal. There are many how-to Linux guides available here. Support – If you have an issue, I’d recommend contacting support directly via email. There is also lots of good information in the forums, although most threads are in German. If you have used Perfect Privacy, feel free to share your honest review (good or bad) below. 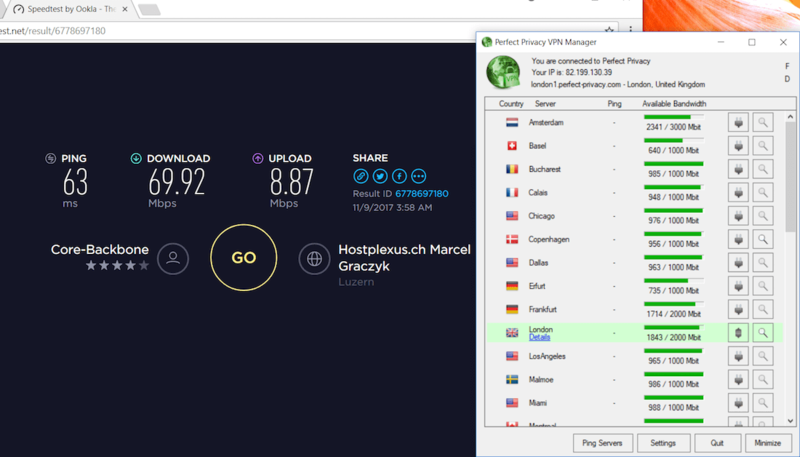 Hi Svan, when it comes to this service, how is the difference between the browser’s/computer’s time zone and the VPN’s server’s location time zone treated? How to resolve that issue while using a/any VPN? Also, do you have any experience with [https://www.ivpn.net/]? Hi Scorpio, there are no issues when using a VPN server in a different country (time zone). If you want to hide your time zone in your browser, that is also easy to do. I discussed IVPN in the WireGuard guide. I am using PP since a 1.5 year and since few months the service is getting worse. First of all they are a decrease in the speed while the sever are 95% free…. which does not make sense. Second, the TrackStop is not working well. Some adults sites and social websites can still be accessed when they should not. Finally, some servers go down without any warning from PP. No communication, no transparency on their side. The customer service is not very nice, and sometimes very arrogant. They do not like to be told that they are facing problems. I told them I will leave if they do not solve the different issues I am facing, but they just didn’t care. Again, you realise that the service is good or not when you start having problem. If you do, I will not recommend PP. They have a very strong stance for privacy, which should be the number one priority for all VPN companies or any other privacy oriented service. I hope they continue to grow and continue advancing their privacy and anonymity techniques. One of the strongest pro-privacy companies I’ve seen is OVPN. They go to great length to provide extreme privacy and anonymity. They are a small company but they focus on quality not quantity. Can you please do a detailed review on OVPN please? They also use RAM disk servers with NO HARD DRIVES and no logs. Thanks for this very detailed review, Sven. As a result of your fantastic review, I ended up subscribing to Perfect-Privacy. I’m not sure if you get a commission from your referral link, but I used it just in case as you deserve the credit for me signing up. The features of this VPN service are world-class and are absolutely essential for maximum privacy. I love the Level 3 killswitch and the TrackStop features at the server level. NeuroRouting and Cascading are also awesome. I now use PP whenever I go online. It even works for Netflix *sometimes* – however, if I need to make sure Netflix and Hulu work, I simply switch to ExpressVPN (which I also subscribe to) while streaming and then switch back to Perfect-Privacy when I’m done and use it as my default for online protection. Thanks for your great reviews, Sven. You have absolutely helped me out. Thanks for the feedback Adam, glad it’s working well for you. Their Mac client software has been on Beta testing for too long. I like their service; however, their Mac client software has been on Beta testing for too long, 10 months. I already asked them about the final version, they said they didn’t have an estimated time yet. So if you use Mac for your main internet stuff I’d advise you to consider this. Update: The Mac OS app is out of BETA and works very well – check it out here. I gave the a try after reading your article about ad blocker vpns. The improved mobile page load speeds are noticeable with trackstop blocking ads that would normally chew up bandwidth. A huge difference. It would be nice if I could whitelist domains, but that’s not a big deal for now. Overall very pleased with this provider. No logs, Switzerland, dedicated servers, and Trackstop. Sold. So I went to VPN.AC and so far I could not be happier (it’s faster and more reliable). Thank you for taking the time to put together such an in-depth review. As the saying goes, you get what you pay for. I have tried several other low cost VPN services – none come even close to the speed/performance of Perfect Privacy. Installation and setup was very straightfoward and follow-up questions to Perfect Privacy about settings/configuration were answered promptly. So far, a very satisfied customer. I have learned this the hard way. Started with free vpns and that was a very bad idea after getting malware on my PC. Then tried Purevpn and that was 100% disaster. Then on to Private internet Access, but canceled because they are US and who knows, maybe NSA. Been using PerfectPrivacy for two weeks now on Windows 7 laptop. Works perfect. I’m done searching for a good vpn. I should have started at this point in the beginning, would have saved lots of frustration. Thanks so much for your reviews that have helped me to make the decision to get Perfect Privacy. It’s working perfectly for me and the write up you have done on many topics related to VPNs is just wonderful. Have used Tor and JonDo in the past but Perfect Privacy is much more superior and in terms of speed. Have followed your advice on using the Tor browser and it’s wonderful. Thanks again for the wonderful work you have done. Signed up to test it out. I’ve been using mostly US servers. Speeds are good, but not quite the fastest VPN I’ve used. But it is by far the most SECURE. The VPN Manager for Windows is impressive. For my iPAD the ikev2 also works good. Have not had to deal with support at all – everything works, no problems. I’ll be staying with them for a while.